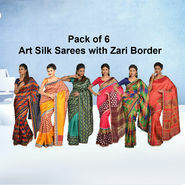 Yamini Set of 6 Printed Art Silk Sarees with Zari Border is not available for purchase currently. Customers also show interest in below products. 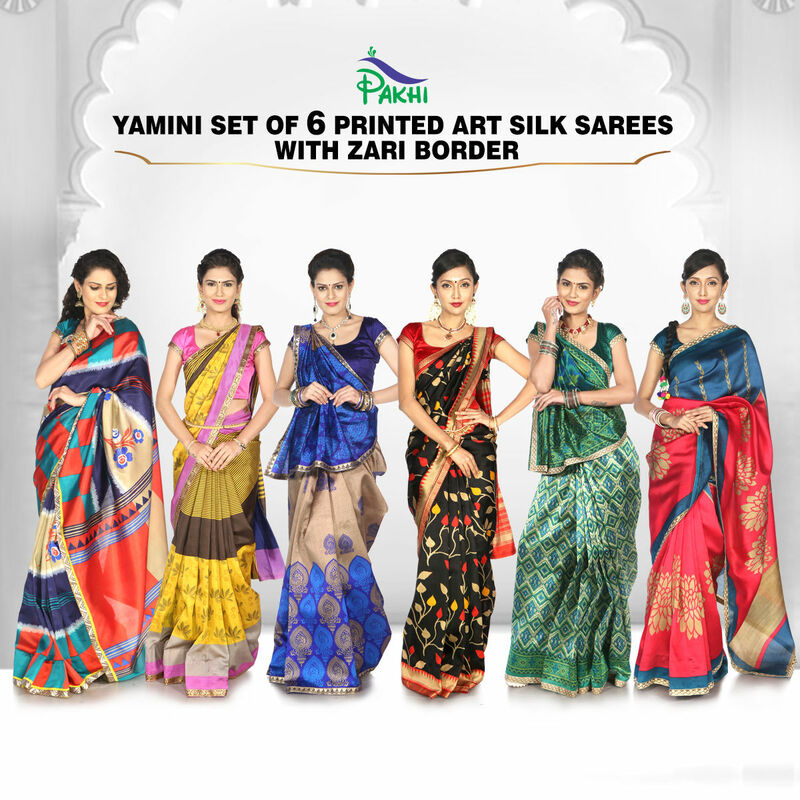 Bring out the charm of ethnicity with Yamini Set of 6 Printed Art Silk Sarees with Zari Border, a must-have addition to your saree collection. 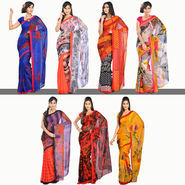 Made from Art Slik fabric, they are lightweight, easy to drape and comfortable to wear all day long. 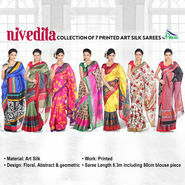 The sarees are embellished with either floral & geometric designs along with appealing zari border. 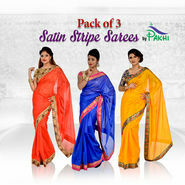 Vibrant and appealing, this saree measures 6.3m and comes with a 80cm blouse piece, sufficient enough to try various styles and designs. 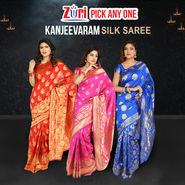 When it comes to buying a saree for weddings or other special occasions, considering Art Silk saree is the best choice to pick. 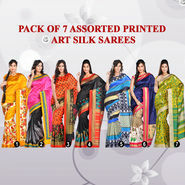 However, buying a silk saree on an occasion every time may burn a hole in your pocket. 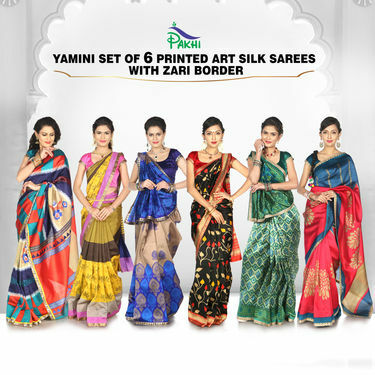 Keeping everything in mind, we reviewed Yamini Set of 6 Printed Art Silk Sarees with Zari Border which is apt for grand occasions. 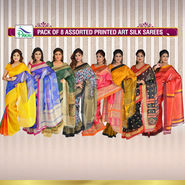 Material: Crafted from Banarasi Art silk, the fabric is of finest quality providing maximum comfort to the wearer. The look and feel of the fabric is so much alike of real silk. Moreover, they are porous, delicate and light weight in nature that gives you weightless feel when worn for long hours. 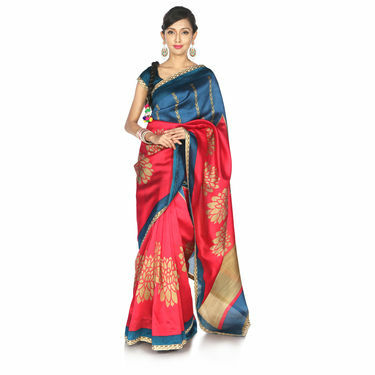 We would highly recommend to buy Amoli Banarasi Art Silk Saree that will make you look vivacious be it wedding, family functions or evening parties. The combo is totally worth the purchase. 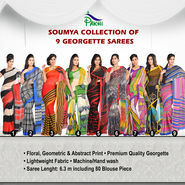 Yamini Set of 6 Printed Art Silk ..VSSoumya Collection of 9 Georgette .. Yamini Set of 6 Printed Art Silk .. VS Soumya Collection of 9 Georgette ..
Yamini Set of 6 Printed Art Silk ..VSPack of 3 Satin Stripe Sarees by .. Yamini Set of 6 Printed Art Silk .. VS Pack of 3 Satin Stripe Sarees by ..
Yamini Set of 6 Printed Art Silk ..VSPack of 6 Assorted Bandhani Saree.. Yamini Set of 6 Printed Art Silk .. VS Pack of 6 Assorted Bandhani Saree..
Yamini Set of 6 Printed Art Silk ..VSPick Any One Assorted Kanjeevaram.. Yamini Set of 6 Printed Art Silk .. VS Pick Any One Assorted Kanjeevaram..